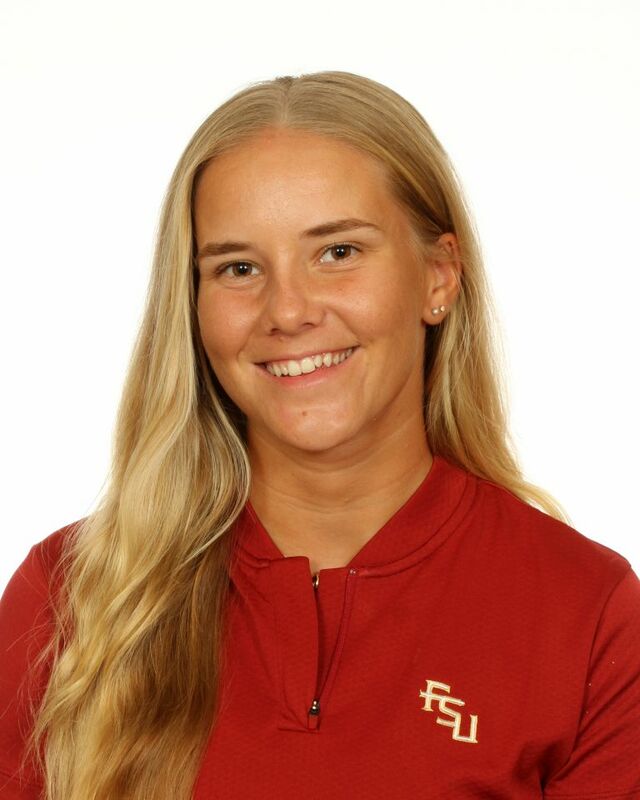 One of three upperclassmen on the Seminoles’ roster who is in her third season as a member of the Florida State women’s golf team…a member of two NCAA Championship teams during the first two seasons of her career…played in the first three events of her career – the Florida State Match-Up, the Evans Derby Experience and the Brickyard Collegiate – during the spring of her sophomore season…played her best golf as a sophomore at the Seminole hosted Florida State Match-Up as she established career-bests in all statistical categories including low round (74) and low tournament score (234)…knows how to play under pressure…from the same city (Espoo, Finland) as Seminole All-American Matilda Castren (2014-17)…has been a member of the Finnish National Team since 2011…played as a member of the Finnish Youth Olympic team in China in 2015…finished in ninth place at the Finnish Ladies Amateur Championship in 2015…2013 Finnish International Girls Championship winner…a member of the Student Athlete Advisory Council (SAAC) at Florida State for the 2017-18 academic year…named to the 2017 and 2018 ACC Academic Honor Roll…earned Dean’s List Academic Honors during the Fall of 2016 and the spring of 2018…averages 78.78 strokes in three tournaments as she begins her junior season. A member of the team but did not play in any matches…a redshirt season. Played in the first three events of her career – the Florida State Match-Up, Evans Derby Experience and the Brickyard Collegiate – as a member of the Seminoles’ lineup in the FSU Match-Up and the Brickyard and as an individual in the Evans Derby Experience …played her best golf in the Florida State Match-Up as she earned career-best scores for a single round (74), for 36 holes (152) and for a three-round tournament (234)…career-best scores for a tournament score vs. par (+17) and for the best finish of her career (tied for 47th) came at the Brickyard Collegiate…averaged 78.78 strokes in nine rounds during three events. Graduated from Mäkelänrinteen Lukio Sport High School in Finland in 2016…a member of the Finnish National team and played in the Girls European Team Championships in 2012, 2013, 2014 and 2015…named the Rookie of the Year in Finland in 2011…participated in 17 events across Europe in the past three years while placing in the top 16 in five of those tournaments…those events included the Skandia Lady Junior Open in 2015 in Sweden (seventh place), 2013 Roger Cartier Trophy in France (ninth place), the 2015 Finnish Ladies Amateur Championship in Finland (ninth place), the Dutch Lady Junior Championship in the Netherlands (15th place), the European Girls’ Team Championship in Slovakia in 2014 (16th place)…earned a bronze medal at the Young Masters as a member of the Finnish National Team in 2013…the junior stroke play champion in Finland in 2013, 2014 and 2015…plays for the Master Golf Club team…finished in a tie for 15th place at the Junior Orange Bowl Classic Tournament in 2012. Born January 27, 1997…Sandra is the daughter of Petra Kuismin-Salonen and Aki Salonen…speaks four languages: Finnish, Swedish, French and English…has earned Finnish championship medals in both dance and basketball…major is sport management. Driver: Nike Vapor Wood: Nike Speed (17 and 75 degrees) Hybrid: Nike Speed (23 degrees) Irons: Nike Procombo – PW Wedges: Nike Vapor (52 and 58 degrees) Putter: Titliest Scotty Cameron Ball: Titleist Pro V1 Favorite Club: Wedge (52 degrees) Superstition: A good luck charm given to me by my caddie at the Youth Olympic Games in China in 2015 and I often mark my ball with the same colors as my outfit that I am wearing for the day.